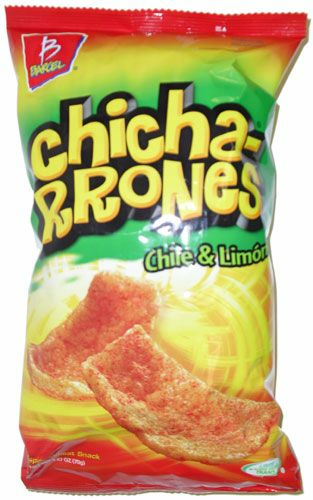 Barcel's Chicharrones are a delicious spicy wheat snack with chili & lime. A great snack, with lots of flavor & crunch for any occasion. Get real...Crunch This! Ingredients: Flour pellet (wheat flour, sodium bicarbonate, salt) palm oil, seasoning (salt, red pepper powder, citric acid, corn flour, lemon juice powder). Contains 2% or less of the following: antioxidants (TBHQ and/or BHA and BHT. 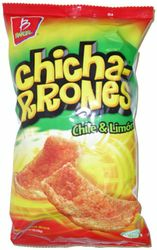 Barcel's Chicharrones con Chile & Limon (Pack of 3) son deliciosos y picantes. Es una gran botana, crujiente y con mucho sabor para cualquier ocasi?n. Prueba ya su crujiente sabor! Ingredientes: Harina (harina de trigo, bicarbonato de sodio, sal) aceite vegetal, sazonador (sal, pimienta roja en polvo, ?cido c?trico, harina de ma?z, polvo de jugo de lim?n). Contiene 2% o menos de lo siguiente: los antioxidantes (THBQ y / o BHA y BHT). ConsA LITTLE TOO SPICY FOR ME. found these at a local gas station and theyre great! These are the best snack! I love the crunch and the spice without the actual pig skin (yuck). They are also low in calories and fat. Yummy!